As we speed through November, we have already enjoyed the first two concerts in the Investec International String Quartet Series. The season opened on 6 October with an explosive entrance by the dynamic and poetic Navarra Quartet which last played here in 2010. This Anglo-Dutch quartet came direct from the Hatfield House Music Festival and stayed here for three days, giving workshops in schools in Hatton, Hampton Lucy, Leamington and Warwick. The Navarra Quartet made its debut in Warwickshire when still at the RNCM in Manchester, performing in 2003 in Over Whitacre as part of the Concerts in Warwickshire Churches series and this was the Quartet’s fourth concert for Leamington Music. The Opus 9 set has some brilliant writing for the first violin and this was almost certainly due to the presence of the young leader of the Esterhazy Orchestra, Luigi Tomasini. (Haydn would have played second violin to him in quartets.) The leader in No 2 soon goes into the stratosphere, only for the motion to be suspended, moving towards a haunting pianissimo. The movement ends however with what has been described as “a flurry of skittering triplets”. The minuet that follows has a Mozartian feel to it, suave and with some interesting inner chromatic lines. The Adagio has a rhapsodic opening seemingly improvised but with a change to triple metre, the leader is gifted a sorrowful song, which would be at home in the opera house. The finale has a catchy, syncopated theme which returns at the start of the development and we can enjoy Haydn’s wit, which is a major factor in setting him apart from all other composers of quartets. It all leads to a bout of gleeful repartee as the quartet comes to a conclusion. break and it grows from a five note motif C-D-Eflat-B-Csharp, which contains the composer’s initials DSCH. He was to use the same device in his Quartet No 8 and Symphony No 10. The fifth Quartet is one of Shostakovich’s most rigorous and unyielding works. The opening adagio is of symphonic proportions completely fulfilled in its driving energy and dense writing. It moves through a mysterious passage using harmonics into the central andante, a haunted vista of slow moving, tenuous simplicity and concerted writing. In the middle, in the exquisite second section, there is one of the loveliest moments in all his works to look forward to. The finale starts with a slow waltz which turns into a massive climax and themes from all three movements are used before subsiding to a quiet but still tenuous close. The final bar of Shostakovich’s third, fourth and fifth quartets are all marked morendo. When you have finished listening to Schubert’s Quartet in G, which takes over three quarters of an hour to play, will you believe that he wrote it down in just ten days in late June 1826? It is a work of considerable dimensions, with the first movement in particular making its mark. The poignant mood foreshadows the first movement of the String Quintet in C written only months before Schubert died. The music is questioning, rhythmically nervous and yet there is serene beauty in the sighing motifs. Except for two stormy interludes, the slow movement is dominated by a melody of heavenly calm and yet there is an undercurrent of menace. In the urgent scherzo, nervous repeated notes predominate, only to contrast with the song-like trio, a Ländler-like tune that has something of a barcarolle about it. If the first movement is a harbinger of the Quintet in C, the last movement looks back to the Death and the Maiden Quartet. Both assume the form of a tarantella, the whirling southern Italian dance in 6/8 time. The dance eventually dies down and the work ends, after references to the Andante, with a simple recitative-like cadence. Schubert never heard a public performance of this great work. He played viola when it was played privately in the home of a friend and just the first movement was included in the only all-Schubert programme to be given in his lifetime in March 1828. The first public performance was given in 1850 by the Hellmesberger Quartet and publication, as Opus 161, by the house of Diabelli in Vienna, followed in 1851. The Haydn has been recorded by the London Haydn Quartet on Hyperion (CDA67611) and the Kodály Quartet on Naxos (8550787) – both of these superb ensembles will appear later in our Winter Season too! The Kodály on Thursday 30 November (tickets available online here) and the London Haydn on Friday 9 March (click here to book). The Shostakovich comes as part of the much-celebrated complete set by the Brodsky Quartet on Teldec (2564608672), the quartet which gave such a memorable concert in our last Winter Season. 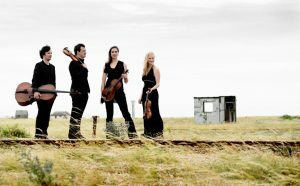 The Atrium Quartet re-opens the season in the New Year on Friday 26 January with No 12 (click here for tickets) and has committed No 5 to disc on the Zigzag label (ZZT080702). The Schubert has also been much recorded over the years by quartets including the Kodály Quartet (Naxos 8557125) and The Lindsays (ASV CDDCA661). Another ensemble appearing recently in Leamington, The Doric Quartet’s Schubert series has been highly praised, and their recording of this quartet on Chandos (CHAN10931), which wasrecently shortlisted for a Gramophone Award, is an “incisive, imaginative account” (The Sunday Times). The Navarra Quartet have appeared on a number of discs, including a recent disc of songs by Pavel Haas on Resonus Classics (RES10183), which received a 5-star review from BBC Music Magazine: “from joy to despair, every emotion is here in subtle colours”. Also worth exploring is their recording of quartets by Peteris Vasks on Challenge Classics (CC72365) and Haydn’s Seven Last Words of Christ on the Cross (Altara ALT1040-D), both of which are available to download only.